Look Left, paper of the Workers' Party, carried a report in the Sept-Oct 2008 edition. Read it here. Several new images of the opening session and Sat. morning. 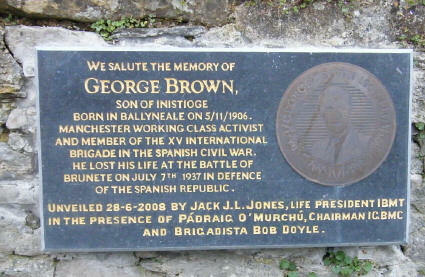 International Brigadier George Brown was commemorated over the weekend of 27-28th June 2008, Inistioge, Kilkenny where he was born. George was one of 4 locally born Brigadiers, including Michael Brennan, Sean Dowling and George's brother, Michael. A local committee was formed to ensure that the memory of these men, but in particular of George, as he'd been killed in action, were commemorated. A Programme of lectures, photographic displays, socials and publications was planned for the weekend. You can read the initial programme here. I can report that this was a very well organised weekend of activities. The venue was marvellous, a very picturesque village on the River Nore, a few miles outside Kilkenny city. Opening the weekend, Joe Doyle, Treasurer of the Committee, pointed to one of the Memorial Stones on the walls of the Church which spoke of the death of a local soldier in Kabul, and of the importance of the lessons of history. 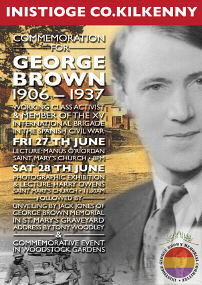 The Committee was pleased to be able to commemorate George Brown, a working class activist, and all those who participated with the Brigades. There were 2 lectures - one by Manus O'Riordan on Friday evening and the other by Harry Owens on Saturday morning. 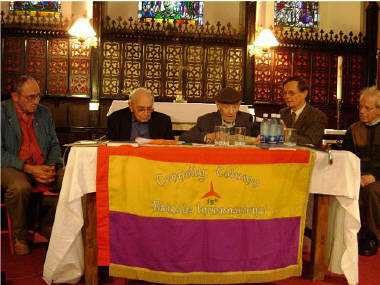 The sessions also saw frequent contributions by 2 veterans of the SCW - Jack Jones, President of the International Brigades Memorial Trust and long time trade union leader. He was joined by Bob Doyle, who is originally from Dublin and who is the last Irish Brigadier. There was a particular reason for Jack to attend this event, along with his family, in that his late wife had initially married George Brown, so as he said George has always been held in particular affection by the Jones family. Bob Doyle spoke at the opening session spreading the message, that people must get active in the fight against capitalism. After Harry's well received speech, the crowd of well over 100 local people moved into the neighbouring cemetery for the unveiling of the plaque. The local people were joined by members of the International Brigade Memorial Trust including the families of several Brigadiers, inc. Irishman Gerry Doran who was represented by his daughter Ann and her children; Sean Edwards, son of Waterford vol. Frank Edwards was also in attendance, as was (obviously) Manus O'Riordan and family - son of the late Mick O'Riordan. Syd Booth, a Manchester volunteer, was represented by his daughter. After the unveiling of the plaque by Jack Jones in the Church of Ireland graveyard, the majority of the crowd moved onto the County Council owned estate of Woodstock, where in the lovely gardens the local Commitee had already erected a plaque to the 4 volunteers in December 2007, and where at the weekend a commemorative tree was planted by Jack Jones (under the direction of Jerry Malone!) to mark the occasion. This site, must be, by far, the most decorative of any commemorations todate in Ireland! Bob Doyle's opening remarks here. Manus O'Riordan's lecture can be read here. I recently found another batch of photographs from the Commemoration. They are available here. There are a few non related photos in this batch (towards the end) but the relevant ones are very good! 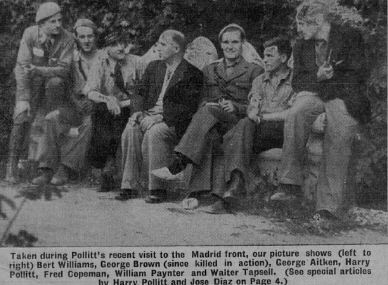 As a contribution to the work of the local committee I wrote a piece on the four Kilkenny men who took part with the International Brigades in the Spanish Civil War. Munster Express notice 19th June This was a small piece advertising the weekend events. Read it here. New Ross Standard notice 11th June This article is available here. RTE Evening News covered the commemoration on the evening news on 28th June. View it here. Here is the start of a gallery of images from the weekend. More will be added here ASAP, especially from the opening session. Thanks to Martin Gahan for sending me about 12 photographs for the report. If anyone else can send me photos it would be appreciated. Thanks to David Convery (Cork) for 6 images. 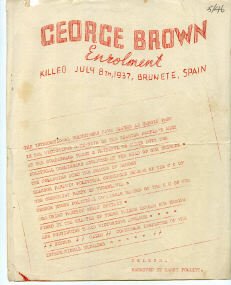 The Inistioge George Brown Memorial Committee (GBMC) has produced a very glossy, 20 page, booklet called George Brown 1906-1937: Working Class activist and member of the XV International Brigade in the Spanish Civil War. I can recommend this publication in the strongest possible terms (and not just because I contributed an article!!!) Martin Gahan must be singled out. He undertook a lot of the extensive work, travelling to Salford to dig through the archives there, etc. along with 2 other Committee members, Terry Bannon and Sean Walsh. Terry also did the layout of the pamphlet. This is a marvellous piece of local and labour history. This pamphlet has a lot of previously unseen material about this important volunteer. 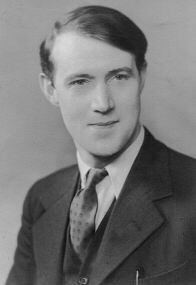 Brown was the highest ranking political activist from Britain to be killed in Spain, having been a member of the Communist Party Central Committee. There was a limited print run of 800 copies, and this will sell out quickly. Orders should be sent to the Secretary, Inistioge George Brown Memorial Committee, The Square, Inistioge, Kilkenny, Ireland as soon as possible if you want to get read about this piece of history. In preparation for this commemoration I retyped an old pamphlet on George, written originally by Mick Jenkins. It can be read here. Kilkenny's fight against Franco Katharine Blake remembers the four local people who listened to the call to arms against fascist dictator General Franco - available Kilkenny People, 30 July 2008. One of the local papers, the New Ross Standard carried this report on July 2nd.